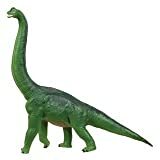 This dinosaur is widely known as Brontosaurus (meaning "thunder lizard"), however the correct scientific name is Apatosaurus (meaning "deceptive lizard"). This is because when Othniel C. Marsh discovered the first two fossils in 1877 and 1879, he did not at first realize that they were adult and juvenile examples of the same species, and hence gave the two fossils different names. Subsequently, it has been realized, that both of these fossils were after all from the same species, so only one name should be used: Apatosaurus is the correct name, because it is was the first name used. Apatosaurus was a massive herbivore (plant-eater) that lived during the late Jurassic period 157 to 146 million years ago in western North America. An adult Apatosaurus measured 70 feet (21.3 meters) long, and weighed a massive 33 tons. When it was first discovered, many scientists believed that Apatosaurus was so huge that it could not have supported its weight on dry land, and therefore must have lived partially submerged in water. If you look at older books about dinosaurs, you may often see Apatosaurus depicted in this way. More recent research and discoveries (including the discovery of fossilized footprints), however suggests that Apatosaurus probably did live on dry land, and probably was a grazing animal that lived in herds. Apatosaurus was a close relative of Diplodocus. Apatosaurus was not as long as its relative, but it was more bulky. Apatosaurus could have reared up on its front legs and brought them down with crushing force on an attacker, or used its tail as a whip in defense. Although most scientists believe that Apatosaurus went extinct many millions of years ago, some cryptozoologists (people who search for rumored or mythical animals whose existence is uncertain) have suggested that an animal rumored to be living in the Congo River basin, known as "Mokele-Mbembe", might possibly be a surviving Apatosaurus, or perhaps another type of sauropod dinosaur. However, although there have been numerous expeditions to hunt for Mokele-Mbembe, there is currently no definitive proof of its existence. For more information see Living Dinosaurs? North American Dinosaurs - Apatosaurus lived in North America. Apatosaurus was a genus of dinosaur. Although "Apatosaurus" is the correct scientific name of this genus of dinosaur, the name "Brontosaurus" is also sometimes used. Apatosaurus has two names, because its discoverer, Othniel C. Marsh did not realize that two different fossil specimens (described in 1877 and 1879 respectively) were actually juvenile and adult examples of the same animal. "Apatosaurus" means "deceptive lizard" ("Brontosaurus" means "thunder lizard"). Apatosaurus was a member of the Saurischia ("lizard-hipped") order of dinosaurs. What this means, is that although Apatosaurus was not closely related to lizards, it did have similarly shaped pelvic bones. Apatosaurus was a Sauropod - a member of a group of related large quadrupedal herbivorous (plant-eating) dinosaur with long necks. Apatosaurus lived between about 157 million years ago and 146 million years ago, during the Jurassic period. Apatosaurus lived in North America. Apatosaurus was a herbivore (plant-eater). Apatosaurus was about 70 feet (21.3 meters) long. Apatosaurus weighed about 33 tons. Take a trip back in time to the Jurassic Period to learn about apatosaurus! With its long neck and massive height, apatosaurus comes to life through immersive, vibrant images. Readers will be enticed to learn more about the dinosaurs' appearance, behavior, and their prehistoric habitat. Realistic illustrations and easy-to-read text help any young reader find something to enjoy. Bring augmented reality to your students by downloading the free Capstone 4D app and scanning for access to additional content. Travel millions of years back in time to meet the Apatosaurus! Learn everything from what the Apatosaurus looked like to what it ate, and even where their goliath fossils have been found today. Complete with a More Facts section and bolded glossary terms. Young readers will gather basic information about the Apatosaurus through easy-to-read, simple text alongside colorful images! Aligned to Common Core Standards and correlated to state standards. Abdo Kids is a division of ABDO. Artie the Apatosaurus wants to be a secret agent, but at 40 feet tall he is not very secret! He is terrible at hiding, he can’t disguise himself, and he is too slow to chase bad guys. In fact, being an Apatosaurus is exactly what makes Artie an awful spy! This hilarious picture book from the Dinosaur Dreams series includes discussion questions, an interactive look-and-find fact section, and dinosaur facts. They’re reusable! The sticker book series that kids love has a new addition: EyeLike Stickers: Dinosaurs. Each book contains 400 full-color stickers that are amazingly detailed and lifelike in quality and are designed to be stuck on, peeled off, and stuck on again without tearing or losing their “stick.” The books’ inside covers are glossy illustrated backgrounds on which kids can create lively and original sticker scenes―and then change them whenever they like. New titles in our popular animal series introduce young readers to five dinosaur species plus a family of flying prehistoric reptiles (the Pterosaurs). In each book, a child explorer travels back in time to meet these incredible animals and shares his or her experiences, which are based on fossil finds. Delightful illustrations and carefully crafted text help the stories come alive, making these books both educational and entertaining. 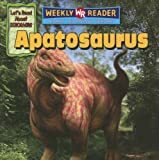 A young child adventures back in time to 150 million years ago to meet an Apatosaurus, learning what this dinosaur ate, its size, and about its babies. This illustrated narrative nonfiction title includes a map of fossil findings, glossary, and further resources. Provides information about apatosaurus, including what they ate, how they interacted with one another, and how they defended themselves. Apatosaurus The Thunder Lizard Dinosaur Books for Young Readers Bestselling author John Davidson presents "Apatosaurus The Thunder Lizard". Beautiful Pictures and easy reading format will help children fall in love with Dinosaurs. This is one of over 50 books in the Amazing Animal Books for Young Readers Series. http://AmazingAnimalBooks.com The series is known as one of the most beautiful on the kindle. The pictures look great even in black and white and are excellent on the full color kindle. Lots of facts and photos will help your children learn about this wonderful animal. Children are given a well-rounded understanding of this beautiful animal: its anatomy, feeding habits and behavior. *** You and your kids will love learning about Dinosaurs*** Table of Contents Introduction Chapter 1: Appearance Chapter 2: Behavior Chapter 3: Environment Conclusion Author Bio Introduction Greetings young reader! Today we are going to take a step back in time and enter the age of the dinosaurs. The dinosaurs are an extinct species of animal that began to live on the Earth over 200 million years ago. “Extinct” means that they no longer exist. The dinosaurs are some of the most intriguing and awe-inspiring animals that have existed on our planet. The dinosaurs’ colossal size, strange characteristics, and mysterious disappearance make them inherently worthy of study and interest. Even more than these reasons, the study of dinosaurs itself is an incredible adventure which requires thought and imagination. The study of dinosaurs helps you to appreciate just how mysterious and amazing life and nature really is. Our planet supports not only us and the animals that live today, but it even supported creatures as gigantic and strange as the dinosaurs- just think how cool that is! I hope that you bring a spirit of openness and wonder to your study of the dinosaurs, and that you come to appreciate the mystery and value of the dinosaurs. The dinosaur we are discussing today is the Apatosaurus. The Apatosaurus was a gigantic herbivore and one of the largest land-dwelling animals to live on earth. It is well known for its gigantic neck and tail but we are not only going to learn about the dinosaur’s appearance, but also its probable behavior and environment. We know what we know about the dinosaurs from a variety of sources including fossils, biology, and other scientific disciplines. Fossils are the ancient remains of the dinosaurs, the most familiar being their bones. Biological science is the study of life in general, but many scientists compare the dinosaurs to modern day animals to support their theories. Before a talk about dinosaurs can take place it is important that we discuss the theory of evolution. Evolutionary theory supposes that all the animals we know and see today are the direct descendants of animals that existed millions of years ago. The dinosaurs and other creatures that existed millions of years ago either died out or gradually changed into different animals. For instance, birds are considered to be surviving dinosaurs because their dinosaur ancestors survived the dinosaur extinction event. All the dinosaurs that children love to learn about and play with. Sculpted in amazing detail according to the latest paleontological research. Extra large means extra realistic! Children marvel at our jumbo-sized collection of some of the best-known dinosaurs to ever roam the planet. 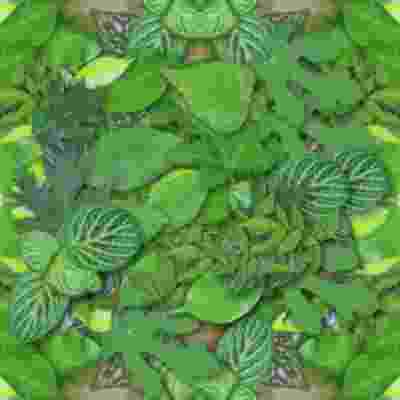 It is perfect for creative play, education projects, dioramas, party favors and crafts. Plant-eating Apatosaurus was one of the largest land animals that ever lived. It had a long neck, tiny brain, and massive legs that left footprints 3 ft. wide. The Wild Safari Dino collection has all the favorites including the Tyrannosaurus rex, Triceratops, Brachiosaurus and many more. Dinosaurs that children love most in a variety of fiercely action packed poses. Each dinosaur replica is amazingly detailed, hand painted for realism and designed to stimulate the imagination. All our figures are sculpted by experts which ensures authenticity. By providing educational information in five languages, we encourage children to learn about these ancient extinct creatures that once roamed our earth. Apatosaurus is living in the end of the cretaceous period,about 68.5 million years to 65.5 million years. Apatosaurus is one of herbivory dinosaurs.Apatosaurus is very kind. Apatosaurus would like to live in groups. 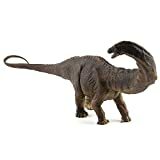 Give this lovable long-necked dinosaur a pat on its adorable head and a tug on its terrific tail! 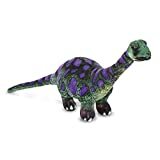 The vibrantly colored purple and green Apatosaurus is soft and squeezable, while sturdy, quality construction and a strong interior structure to keep it standing proudly means it will hold up to years of hugs and snuggling. This dynamic dino stands about 16 inches tall and stretches more than three feet long! 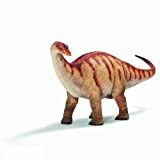 The impressive, prehistoric pal will spark the imagination, promote creative play, and is sure to be a beloved member of any child’s menagerie. For almost 20 years now, Papo has been helping younger and older children to develop and to discover the world around them. Childhood is a time of dreams and adventures, and this was what we had in mind when we decided to create the first princesses, princes, dragons and Knights. Thanks to the originality of its products and the extreme care taken with product quality and safety, over the years Papo has proved popular with children and their parents. Today a reference in the world of 55039 figures, Papo continues to develop new ranges to inspire the imaginations of children the world over. In an age of mass consumption and throwaway goods, Papo remains true to its wish to produce fine toys which last over time and which can be passed on from generation to generation. The graceful curved neck of this recognizable prehistoric giant stretches to reach the tallest trees. Safari Ltd takes pride in providing breathtaking and innovative figures for over three generations. The figure is perfect for creative play, educational projects, party favors and crafts. TOTS & TEENS - From high school projects to toddler play time, these dinosaurs toys are fun for all! HAND PAINTED - Enjoy realistic detail like no other! Each dinosaur toy is carefully painted by hand. SATISFACTION GUARANTEED - You and your kid will love this dinosaur play set, or your money back! Whether you've got a toddler that loves dinos, a teen that's crazy for carnivores, or an adult that adores Jurassic Park, Shoof plastic dinosaurs are a perfect choice. Limited only by their imaginations, you or your kids can dodge dangerous volcanoes, waltz through lush forests, soar through the air, and more! Want a toy that's educational and fun for your kiddo? These dinosaur figurines come with an informational play mat! Teach your kids what the dinos ate, where they lived, and how tall they were! Plus, the set comes with a matching game that helps kids develop cognitively and enjoy learning. Durability is key when it comes to kids toys. Extra-strong plastic ensures these toys won't break no matter how many times the dinosaurs stomp, clash, and crash. Kids can take their dinos with them and have fun everywhere, from recess to car rides to bath time and beyond! We know how important safety is as a parent. That's why these dinosaurs for toddlers are made of BPA-free plastic to keep your kid healthy no matter how much they play. Encourage your kid to learn, have fun, and be creative with dinosaur toys that are built to last. The entire Shoof play set is 100% satisfaction guaranteed. If you're not completely happy with the dinosaur toys for toddlers, contact us. We'll do what it takes to fix any issues! Time for some Jurassic-sized fun! Add Shoof's Dinosaur Toys to your cart TODAY!